In its primary colours, geometrical forms and weightless composition floating in seemingly endless space, this painting of Wassily Kandinsky’s recalls the Suprematism of Kazimir Malevich, whom the artist had discovered in Russia. An intersection of diagonals modulated by checkerboards, triangles, quadrilaterals and three short lines underlining the chief axis of composition, Sur blanc II[On White II] can also be seen as a geometricized rendering of a motif that Kandinsky painted on a number other occasions, that of St George and his lance. 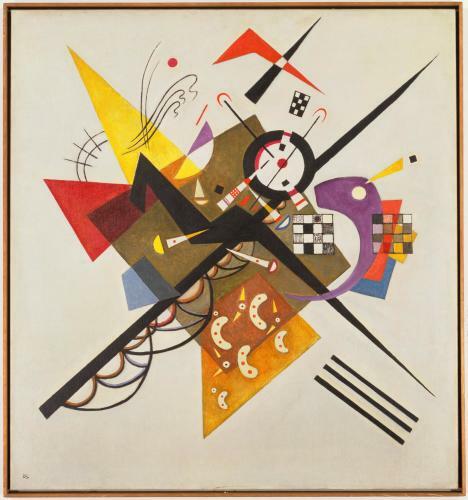 This tremendous work would have a place of honour in Kandinsky’s dining-room at his home at the Bauhaus in Dessau.